codlord’s Form Translator allows the owner of a Form to automatically translate and generate copies of the form in other languages. Click here to install from the Chrome webstore. A free Google Forms add-on. Automatically translate forms using Google Translate. Optionally review the automatic translations and manually edit/translate any items. Use the Quick Start feature to instantly generate a new translated form. Choose the languages to translate to. 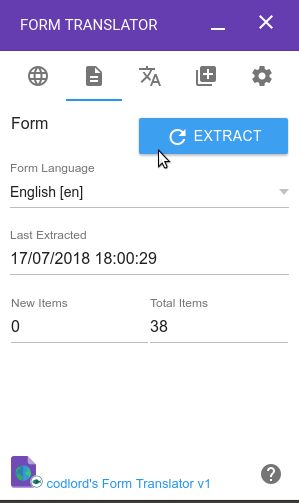 Extract text items from your form. Translate the text items automatically and/or manually. Please see Permissions & Verification for details on the permissions this add-on requires. Note: the developer has NO access to your form questions, responses or spreadsheet data. Google limits the number of translations that can be done in any 24 hour period. If your translations begin to fail then you have exceeded your daily quota limit and will have to wait at least 24 hours before you can perform more translations. The add-on user interface text has been automatically Google translated from English to all languages supported by the Google Translation API (at the time of publishing) and will automatically display in the language specified in your Google account locale setting (if supported). However, the automatic translations may not be correct. Extract – All the text items in your form will be extracted. Translate Text – All the extracted text items will be translated. New Form – A new translated form will be generated. 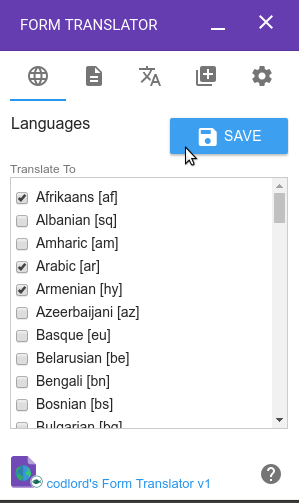 Choose one or more languages you wish to translate your form to and click the SAVE button. Choose your source Form Language and click the EXTRACT button to extract text items from the form. 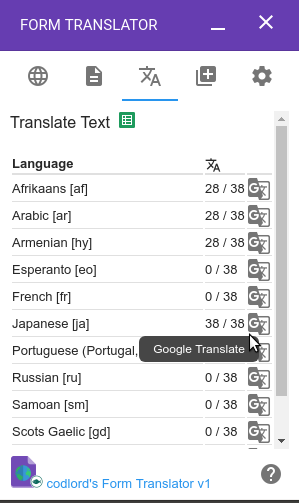 Click a Google Translate icon next to a language to start the text translation process for that language. The numbers next to each language show the number of text items extracted from your form and the number of text items translated. Optional: open the spreadsheet to review translation results or enter translations manually. 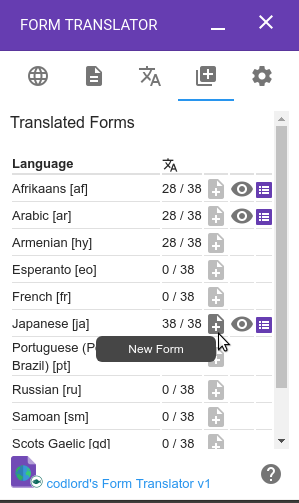 Click a New Form icon next to each language to create a new translated form for that language. Click a Preview Form icon to preview the new forms. Click a Edit Form icon to edit the new form. Change settings and click the SAVE button. Display Language – Select the add-on display/interface language you wish to use. Create Response Spreadsheets – If this option is checked then response spreadsheets will be automatically created when new forms are created. Folder for New Files – Choose a Google Drive folder where new form/spreadsheet files will be created. By default, new files will be created in your Google Drive root folder.